In a few situations, the option of not lodging a health insurance claim can be a better way out in terms of the cost and time involved. You pay a premium every year for your health insurance so that if an unfortunate event happens, you will lodge a claim and get a compensation for the loss. However, in real life, people either do not claim from their policy due to lack of awareness of the terms and conditions, because they don’t know how to make a claim, or because they act penny wise and pound foolish by filing a claim for the smallest of expenses. In this article, we’ll discuss a few situations where it may be a better idea NOT to claim from your health insurance policy. 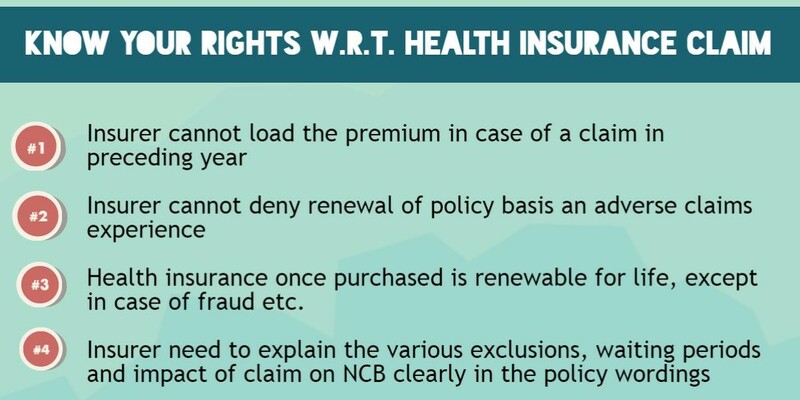 If you renew your health insurance policy every year without lodging any claim, insurers incentivise you in the form of a NCB which means your sum assured increases by a certain percentage (varies from policy to policy) per claim free year. However, if you happen to claim in a particular year, the accumulated NCB decreases by the same percentage. So, before lodging a claim, especially if the amount is very small, do cost benefit analysis vis a vis the loss of NCB, and proceed accordingly. Usually, employers will not charge you for group health insurance, so it’s much better to make a claim on that policy, before turning to yours. Though not sufficient by themselves due to a variety of reasons, group plans may have some one-ups on individual policies, for e.g. no waiting period on pre-existing conditions, better room type selection, etc. as compared to an individual plan, resulting in a higher chance of your claim being paid out in full. If you claim from the group plan, you do not disturb the accumulated No Claim Bonus (NCB) in your individual plan. Hence, you can enjoy a higher sum assured in your individual plan which can come to use at a later date in case your group plan falls short. In case an issue in claims processing, your employer may have a better bargaining power with the insurer as compared to you as a standalone consumer, and it can definitely ease you of any tension. Payment of a health insurance claim depends on the wordings of the policy document, and not what you thought or what the agent told you at the time of purchasing the policy. Hence, before lodging the claim, check for things like whether illness falls in an exclusion, or a waiting period applies, nature of expense claimed is admissible w.r.t. the policy wordings etc. Lodging a claim without paying attention to these finer points will only lead to unnecessary stress and heartburn. As per the rules, insurer is not liable to pay the claim if your policy stands expired at the date of making the claim. Even if the policy is under a grace period, no insurance cover in available if something happens during that period. So, it is important to set a reminder in advance and renew the policy on time else you can miss out on the policy benefits when you most need them. Though it’s a fact that the true worth of an insurance policy is known only when you make a claim, however this is not a sound reason to lodge a claim mindlessly. Instead, one should step back and look whether a claim is required or there is a better way out in terms of the cost and time involved.